Variations in the total column water vapour in the atmosphere since July 1983 according to The International Satellite Cloud Climatology Project (ISCCP). Last data: June 2008. Last figure update: 14 June 2009. The upper graph (blue) in the diagram above shows the total amount of water in the atmosphere. The green graph shows the amount of water in the lower troposphere between 1000 and 680 mb, corresponding to altitudes up to about 3 km. The lower red graph shows the amount of water between 680 and 310 mb, corresponding to altitudes from about 3 to 6 km above sea level. The marked annual variation presumably reflects the asymmetrical distribution of land and ocean on planet Earth, with most land areas located in the northern hemisphere. The annual peak in atmospheric water vapour content occur usually around August-September, when northern hemisphere vegetation is at maximum transpiration. The annual moisture peak occurs simultaneously at different levels in the atmosphere, which suggests an efficient transport of water vapour from the planet surface up into the troposphere. The time labels indicate day/month/year. There is a possibility that the step-like change shown 1998-1999 to some degree may be related to changes in the analysis procedure used for producing the data set, according to information from ISCCP. Water vapour is the single most important greenhouse gas, and climate models forecast an increasing amount of atmospheric water vapour along with global temperature increase, because of enhanced evaporation of water from the planet surface. In addition to its direct greenhouse effect, water vapour is also important for cloud formation. Click here to see a few notes on this. Click here to download the raw data used to generate the above diagram. Use the following search parameters: Relative humidity, mb, 90N-90S, 0-357.5E, monthly values, area weighted grid. Click here to download the raw data used to generate the above diagram. Use the following search parameters: Specific humidity, mb, 90N-90S, 0-357.5E, monthly values, area weighted grid. Click here to jump back to list of contents. 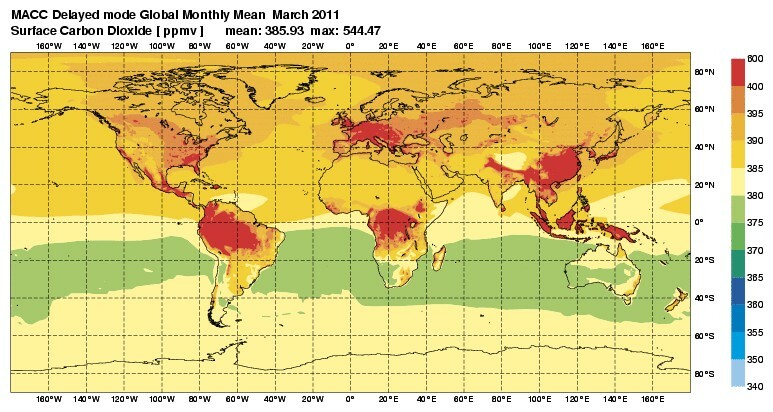 Average March 2011 surface concentration of CO2 (ppmv). The delayed-mode stream is running several months real-time to make maximum use of satellite and in-situ observations that are currently not provided in real-time. Source: Monitoring Atmospheric Composition and Climate (MACC-II). Click here to se the original diagram or to check for a more recent update. Please note that the map projection used above is of the type Mercator. This is a useful cylindrical map projection that preserves angles at all locations, but scale varies from place to place, distorting the size of land areas. In particular, areas closer to the poles are more affected, making land areas of similar size looking increasingly oversized towards the poles. To exemplify this effect, the areas of Mexico (1,972,550 km2) and Greenland (2,166,086 km2) are comparable in size. Greenland, however, in the map looks very much bigger than Mexico, even though only the southern half of Greenland is shown. The visual effect of this popular map type is to overstate the importance of temperature variations near the poles, compared to equatorial regions. Monthly amount of atmospheric CO2 since March 1958, measured at the Mauna Loa Observatory, Hawaii. Data are reported as a dry mole fraction defined as the number of molecules of carbon dioxide divided by the number of molecules of dry air (water vapour removed), multiplied by one million (ppm). The thin line shows the monthly values, while the thick line is the simple running 37 month average, nearly corresponding to a running 3 yr average. Last month shown: March 2019. Last diagram update: 14 April 2019. Click here to download the entire series of monthly CO2 values since March 1958. Click here to read paper on the phase relation between atmospheric CO2 and global temperature. Annual (12 month) growth rate (ppm) of atmospheric CO2 since 1959, calculated as the average amount of atmospheric CO2 during the last 12 months, minus the average for the preceding 12 months. The graph is based on data measured at the Mauna Loa Observatory, Hawaii. Data are reported as a dry mole fraction defined as the number of molecules of carbon dioxide divided by the number of molecules of dry air (water vapour removed), multiplied by one million (ppm). The thin blue line shows the value calculated month by month, while the dotted blue line represents the simple running 3 year average. Last month shown: March 2019. Last diagram update: 14 April 2019. Click here to compare with sea surface temperature. Visual association between Oceanic Niño Index (ONI) and annual growth rate of atmospheric CO2. Upper panel: Annual (12 month) growth rate (ppm) of atmospheric CO2 since 1959, calculated as the average amount of atmospheric CO2 during the last 12 months, minus the average for the preceding 12 months (see diagram above). The graph is based on data measured at the Mauna Loa Observatory, Hawaii. Lower panel: Warm (>+0.5oC) and cold (<0.5oC) episodes for the Oceanic Niño Index (ONI), defined as 3 month running mean of ERSSTv4 SST anomalies in the Niño 3.4 region (5oN-5oS, 120o-170oW)]. For historical purposes cold and warm episodes are defined when the threshold is met for a minimum of 5 consecutive over-lapping seasons. Anomalies are centred on 30-yr base periods updated every 5 years. See also this diagram. Last diagram update: 14 April 2019. Click here to download the entire series of the Oceanic Niño Index (ONI) since December 1949 - February 1950. 12-month change of global atmospheric CO2 concentration (Mauna Loa; green), global sea surface temperature (HadSST3; blue) and global surface air temperature (HadCRUT4; red dotted). All graphs are showing monthly values of DIFF12, the difference between the average of the last 12 month and the average for the previous 12 months for each data series. Last month shown: February 2019. Last diagram update: 31 March 2019. Click here to read discussion on the fact that DIFF12 changes of atmospheric CO2 are tracking about 10-12 months after corresponding DIFF12 changes in air- and sea surface temperature. Click here to read the original paper (Humlum et al. 2012) on the phase relation between atmospheric CO2 and global temperature, describing in greater detail the interpretation of the diagram above. Superimposed plot of five different global monthly temperature estimates shown individually elsewhere. As the base period differs for these estimates, they have all been normalised by comparing to the average of their initial 120 months (10 years) from January 1979 to December 1988. Click here to go to the associated comparison of these five temperature records. The heavy black line represents the simple running 37 month (c. 3 year) mean of the average of all temperature estimates (before 1979 only the three surface records). The blue graph shows the amount of atmospheric CO2 (Mauna Loa station, Hawaii, see also above). The heavy blue line represents the simple running 37 month (c. 3 year) mean of the monthly CO2-values. The scale for atmospheric CO2 (right) is adjusted to display the CO2-graph roughly parallel to the 1975-2000 temperature increase. For the first two decades in the 21st century a warming of about 0.2°C per decade is projected for a range of SRES emission scenarios according to the 2007 IPCC Summary for Policymakers (p.7 and Fig.SPM.5). Last month shown: February 2019. Last diagram update: 31 March 2019. Diagram showing the University of Alabama (UAH) monthly global surface air temperature estimate (blue) and the monthly atmospheric CO2 content (red) according to the Mauna Loa Observatory, Hawaii. The Mauna Loa data series begins in March 1958, and 1958 has therefore been chosen as starting year for the diagram. Reconstructions of past atmospheric CO2 concentrations (before 1958) are not incorporated in this diagram, as such past CO2 values are derived by other means (ice cores, stomata, or older measurements using different methodology), and therefore are not directly comparable with modern atmospheric measurements. The dotted grey line indicates the approximate, overall linear temperature development, and the boxes in the lower part of the diagram indicate the relation between atmospheric CO2 and global surface air temperature, negative, positive or none. Last month shown: March 2019. Last diagram update: 14 April 2019. Diagram showing the Remote Sensing Systems (RSS) monthly global surface air temperature estimate (blue) and the monthly atmospheric CO2 content (red) according to the Mauna Loa Observatory, Hawaii. The Mauna Loa data series begins in March 1958, and 1958 has therefore been chosen as starting year for the diagram. Reconstructions of past atmospheric CO2 concentrations (before 1958) are not incorporated in this diagram, as such past CO2 values are derived by other means (ice cores, stomata, or older measurements using different methodology), and therefore are not directly comparable with modern atmospheric measurements. The dotted grey line indicates the approximate, overall linear temperature development, and the boxes in the lower part of the diagram indicate the relation between atmospheric CO2 and global surface air temperature, negative, positive or none. Last month shown: March 2019. Last diagram update: 14 April 2019. Diagram showing the HadCRUT4 monthly global surface air temperature estimate (blue) and the monthly atmospheric CO2 content (red) according to the Mauna Loa Observatory, Hawaii. The Mauna Loa data series begins in March 1958, and 1958 has therefore been chosen as starting year for the diagram. Reconstructions of past atmospheric CO2 concentrations (before 1958) are not incorporated in this diagram, as such past CO2 values are derived by other means (ice cores, stomata, or older measurements using different methodology), and therefore are not directly comparable with modern atmospheric measurements. The dotted grey line indicates the approximate, overall linear temperature development, and the boxes in the lower part of the diagram indicate the relation between atmospheric CO2 and global surface air temperature, negative or positive. Last month shown: February 2019. Last diagram update: 30 March 2019. Diagram showing the NCDC monthly global surface air temperature estimate (blue) and the monthly atmospheric CO2 content (red) according to the Mauna Loa Observatory, Hawaii. The Mauna Loa data series begins in March 1958, and 1958 has therefore been chosen as starting year for the diagram. Reconstructions of past atmospheric CO2 concentrations (before 1958) are not incorporated in this diagram, as such past CO2 values are derived by other means (ice cores, stomata, or older measurements using different methodology, and therefore are not directly comparable with modern atmospheric measurements. The dotted grey line indicates the approximate, overall linear temperature development, and the boxes in the lower part of the diagram indicate the relation between atmospheric CO2 and global surface air temperature, negative or positive. Last month shown: March 2019. Last diagram update: 18 April 2019. Diagram showing the GISS monthly global surface air temperature estimate (blue) and the monthly atmospheric CO2 content (red) according to the Mauna Loa Observatory, Hawaii. The Mauna Loa data series begins in March 1958, and 1958 has therefore been chosen as starting year for the diagram. Reconstructions of past atmospheric CO2 concentrations (before 1958) are not incorporated in this diagram, as such past CO2 values are derived by other means (ice cores, stomata, or older measurements using different methodology), and therefore are not directly comparable with modern atmospheric measurements. The dotted grey line indicates the approximate, overall linear temperature development, and the boxes in the lower part of the diagram indicate the relation between atmospheric CO2 and global surface air temperature, negative or positive. Last month shown: March 2019. Last diagram update: 17 April 2019. Most climate models assume the greenhouse gas carbon dioxide CO2 to influence significantly upon global temperature. It is therefore relevant to compare different temperature records with measurements of atmospheric CO2, as shown in the diagrams above. Any comparison, however, should not be made on a monthly or annual basis, but for a longer time period, as other effects (oceanographic, etc.) may well override the potential influence of CO2 on short time scales such as just a few years. It is of cause equally inappropriate to present new meteorological record values, whether daily, monthly or annual, as support for the hypothesis ascribing high importance of atmospheric CO2 for global temperatures. Any such short-period meteorological record value may well be the result of other phenomena. What exactly defines the critical length of a relevant time period to consider for evaluating the alleged importance of CO2 remains elusive, and is still a topic for debate. However, the critical period length must be inversely proportional to the temperature sensitivity of CO2, including feedback effects. If the net temperature effect of atmospheric CO2 is strong, the critical time period will be short, and vice versa. However, past climate research history provides some clues as to what has traditionally been considered the relevant length of period over which to compare temperature and atmospheric CO2. After about 10 years of concurrent global temperature- and CO2-increase, IPCC was established in 1988. For obtaining public and political support for the CO2-hyphotesis the 10 year warming period leading up to 1988 in all likelihood was important. Had the global temperature instead been decreasing, politic support for the hypothesis would have been difficult to obtain. Based on the previous 10 years of concurrent temperature- and CO2-increase, many climate scientists in 1988 presumably felt that their understanding of climate dynamics was sufficient to conclude about the importance of CO2 for global temperature changes. From this it may safely be concluded that 10 years was considered a period long enough to demonstrate the effect of increasing atmospheric CO2 on global temperatures. Adopting this approach as to critical time length (at least 10 years), the varying relation (positive or negative) between global temperature and atmospheric CO2 has been indicated in the lower panels of the diagrams above. Click here to read a few reflections on the relation between global temperature and the amount of atmospheric CO2. 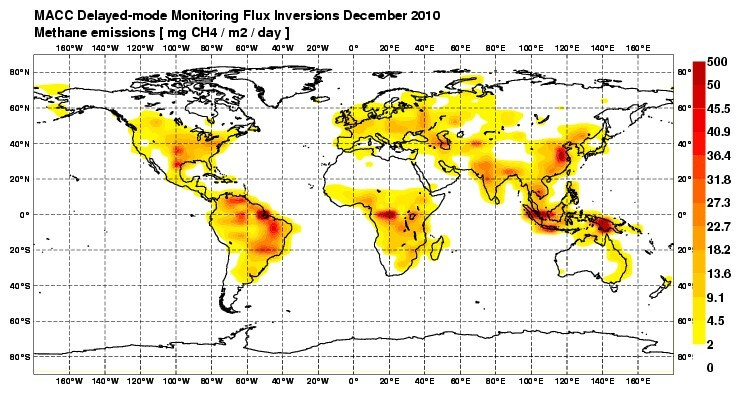 Average December 2010 methane emissions per day (mg CH4/m2). The delayed-mode stream is running several months behind real-time to make maximum use of satellite and in-situ observations that are currently not provided in real-time. Source: Monitoring Atmospheric Composition and Climate (MACC-II). Click here to se the original diagram or to check for a more recent update. Plot showing showing the growth of atmospheric methane (in the marine boundary layer), the seasonal variations and the difference between northern and southern hemispheres (NOAA, GLOBALVIEW), from 1993 to 2002. Diagram showing monthly of atmospheric CH4 since April 1984 at Cape Grim, Tasmania, Australia. Last month shown: December 2015. Last diagram update: 5 October 2016. Click here to download the Tasmania data record since 1984. Diagram showing variations of atmospheric CH4 since May 1983 at Mauna Loa, Hawaii. No smoothing has been attempted, as data points are not equidistant. A number of apparent observation outliers have been removed. Last day shown: 29 December 2015. Last diagram update: 5 October 2016. Click here or here to download the original Mauna Loa CH4 data series.